Another full day and a lot of information to tell you. Meeting with Rabbi Kolesnik in Ivano-Frankivsk. Photo © 2013 Marla Raucher Osborn. First, in Ivano-Frankivsk this morning, Alex Denysenko and I met for 2 hours with Rabbi Moyshe Leib Kolesnik to discuss a number of Rohatyn items. We not only filled him in on the headstone project, but also raised the issue of the human remains found almost 2 years ago in a tunnel below Rohatyn’s Ukrainian Church – and which to-date have not been re-buried. Our [genealogy] group has discussed this topic several times over the last 2 years, but there has been no definite, united position taken on what to do with them. It is – and has been – my strong opinion that a decision must now be made, and as the Church has been looking to us to take the initiative, that is what I have done. Reviewing the issue of the human remains found under the church. Photo © 2013 Marla Raucher Osborn. As you know, there is no certainty that these 12 human skeletons are Jewish or non-Jewish. But, they are human and deserve respectful treatment and final burial. Without costly DNA testing (which may not render definitive, unequivocal results), we will never know for sure who these poor individuals were and how they died. All we know is that these remains are at least 50 years old. So, with the concurrence of Rabbi Kolesnik, we agreed that he will coordinate and preside over the burial of these remains just outside the boundary of Rohatyn’s “new” Jewish cemetery. He will coordinate this procedure with Father Bihun, the Priest of the Ukrainian Catholic Church in Rohatyn where they were found. (Father Bihun is “on board” with this idea – discussed below – and has already made a wooden coffin). I confidently and contentedly now leave this project in the capable hands of the Rabbi and the Priest. 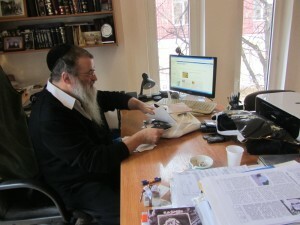 Second, I shared with the Rabbi, at his request, photos on my computer of the scraps of Jewish papers found in 2011 in the former Judenrat building in Rohatyn, and subsequently donated to Hesed in Lviv. I put these 300 or so photos onto a thumbdrive and donated it to him to peruse at his convenience. Documents concerning the Rohatyn cemeteries. Photo © 2013 Marla Raucher Osborn. 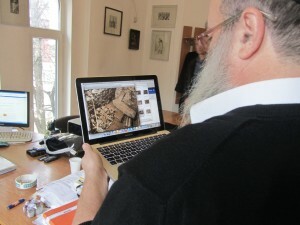 Third, we discussed the headstone project. The Rabbi produced several pages of (poor quality) copies of drawings and 1920s era maps of Rohatyn’s two Jewish cemeteries, which he used in constructing the fences several years ago. It appears that these maps originally came from the archives in Lviv and Ivano-Frankivsk. Query if the originals are still there. The Rabbi did not know. I will provide copies of these to Andrij Bojarov as well as this group in a subsequent post, as the maps at least show boundaries, which is important and necessary to the project, as you are aware. 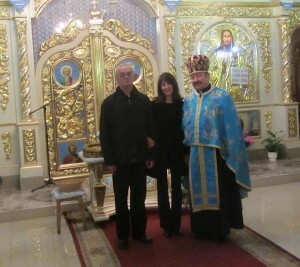 After leaving Ivano-Frankivsk, we then drove to Rohatyn to talk directly with Father Bihun, who was at the Ukrainian Church. He immediately recognized me, even though it has been over 2 years since I last met with him. He was very pleased with our discussions with Rabbi Kolesnik about the human remains, and promised to coordinate with the Rabbi a tasteful, simple ceremony. 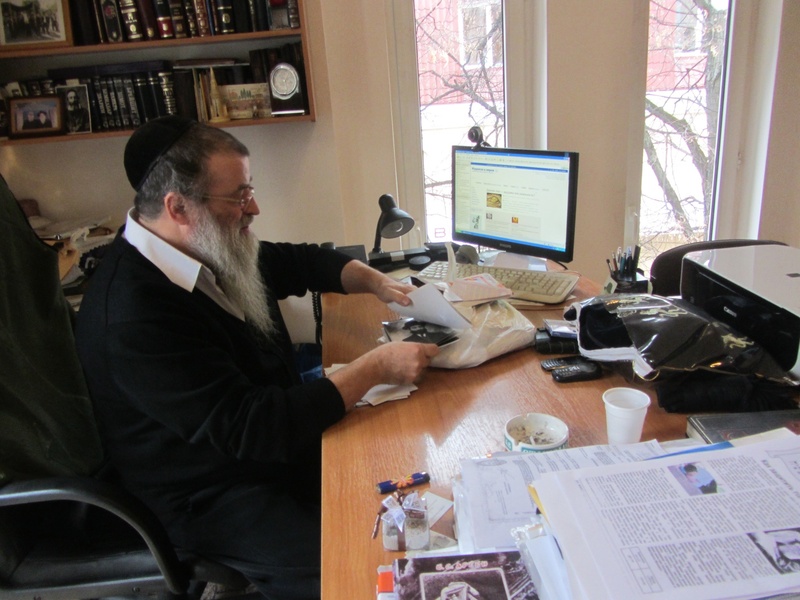 Potential good news which MAY solve our on-going and future issues about long-term maintenance of Rohatyn’s Jewish sites (cemeteries and mass graves) in light of Mr. Vorobets’ desire to retire at the end of this year. Meeting with Father Bihun in Rohatyn. Photo © 2013 Marla Raucher Osborn. Father Bihun is involved with the international Catholic charity known as “Caritas”. Through this charitable organization, disadvantaged students of Rohatyn’s agri-college are provided free home-cooked meals. Father Bihun has recently constructed a new kitchen and food-making facility on the side of the Ukrainian Church. He proposed – and I promised to raise with our group – the possibility of a collaboration whereby the RSRG would make an annual charitable donation to Caritas, earmarked for Rohatyn, in return for which the students would provide maintenance and care services (mowing, weeding, repairs, etc). I think it is a terrific idea and practical way to not only make the students aware of Jewish heritage in their town, but also connect the Jewish community (via our group) with the town of Rohatyn and its current non-Jewish inhabitants. The students would all be local, and the Jewish community as represented by the RSRG would be acknowledged officially as a contributor to their care via this charitable program. Father Bihun promised there would be full transparency as to how, when, and to whom our donation would be applied via the meals to these disadvantaged Rohatyn students. And, as Caritas is an internationally- recognized charitable organization, I think we can have confidence in our participation, while also securing on-going, on-site care of our Jewish heritage sites. Such care will become that much more important once we no longer have Mr. Vorobets AND as our headstone project is realized. I would hope we would be in a position to give an answer (and a donation) by next summer’s 70th anniversary commemorations, which I hope to attend – hopefully also with some of you. Lastly, in the name of and on behalf of the RSRG, I made a cash donation of 800 UAH ($100) to Rabbi Kolesnik, and 400 UAH ($50) to Father Bihun. Special thank you to Alex D. and his driver Vitaly for taking me to Ivano-Frankivsk, spending the night, and then through Rohatyn on our way back to Lviv.